Black section of wall is chalk board paint purchased from home depot. Artwork is hung in clear box cases found at Michaels Craft Store. Mirrors behind art supplies were also purchased at Michaels Craft store in a pack of six. The shelves the art supplies are on I made myself. Bought a long narrow board from home depot, painted it, and secured it to the wall with T brackets. The blue table you see with the red and green chair (there are four chairs to this set) was purchased at Big Lot's for $40.00. Most of the art supplies on the top shelf are stored in baby food jars. The string is stored in a sugar dispenser from the dollar store, and a few of the other clear plastic cups were purchased at Walmart. The art supplies on the bottle shelf are all stored in clear containers that I purchased at Dollar Tree. Some of the stuff that is in the containers... bottle caps, ribbon, chalk, styrofoam balls, wikki sticks, cotton balls, little shells, googly eyes, crayons, pony beads, wood shapes, buttons, colored pasta, pom poms, clothes pins, etc. This whole storage system was purchased at Target. You can buy how ever many cubes you want and they give you a TON of options on what to put in each cube... shelves, buckets, bins, doors, etc. They also come in many different colors. Love this system. Magnetic white board. Shoe organizer underneath cut into strips and hung with staples. The "table" the lamp is on was also purchased at target. The table the light panel is on I built myself. I got a piece of wood from home depot, had the saw guy cut the legs and top to the dimensions I wanted and then screwed it all together. Magna tiles, wedgits, random plastic containers for "baking cookies"/sorting, etc. All the toys on the bottom can be found in our products we love section under supplies. Natural materials... sand, acorns, bark, shells, sticks, rocks The container with the blue top was purchased at dollar tree. The container the bark is in was purchased at Michaels Craft Store. The wood boxes at the bottom holding sticks, rocks, and shells were boxes that some of our toys and puzzles came in. Containers on the top were all purchased at Dollar Tree. They contain colored epsom salt and colored rice. The rest of the containers are empty food jars. They contain jems, marbles, moon rocks, mosaic tiles, acrylic letters, dollar store shot glasses, and insect blocks. The baskets underneath are filled with different puzzles. Baskets were purchased at Dollar Tree. Close up... colored epsom salt, colored rice, marbles, translucent cups, gems, tiles, etc. Everything you see here was purchased at Discount School Supply and can be found here. Sensory table equipment, bubbles, balloons, chalk, etc. Shelving, spray bottles, ketchup bottles, balloons, bubbles, and clear containers were all purchased at Walmart. All the measuring cups, cupcake tins, turkey baster, spoons, funnels, etc. were purchased a the dollar store. Some changes that have been made since first post. Top from left to right: whiteboard markers, whiteboard crayons, touch and feel cards, magnetic letters/numbers. Both the touch and feel cards and magnetic letters and numbers can be seen on our Amazon store. Middle buckets are all felt board stories: If You Give a Moose a Muffin, The Napping House, The Very Hungry Caterpillar, Mouse Paint, and 5 Monkeys Sitting in a Tree. Bottom right are just random felt board animals. Painted over blackboard wall and added peg board. 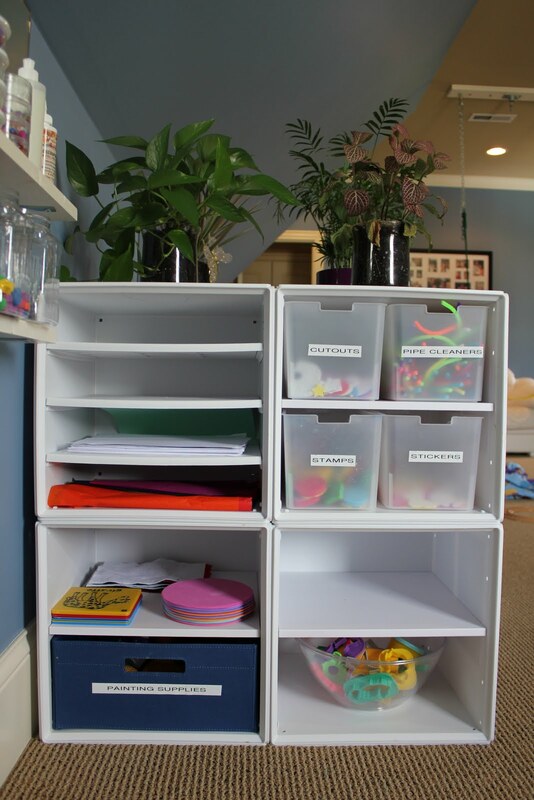 Organized Sensory shelves. Brought in our art table from outside. Playmobil area got a uplift as well. Added another shelf for furniture and also added lighting. Took down felt accessories from peg board and made room for light materials. Created boxes for felt stories and books. very nice set up thanks for taking time out to explain and show everything that you have available. Love the blue color on your walls in the reading area, it is so inviting and calm. Your entire use of space and storage throughout is wonderful. Aren't you afraid the 15-month old or 2-year old will choke on some of the smaller pieces? We move into a new house next summer and i'm really looking forward to creating a bedroom and play space for my little one - this is so inspiring! 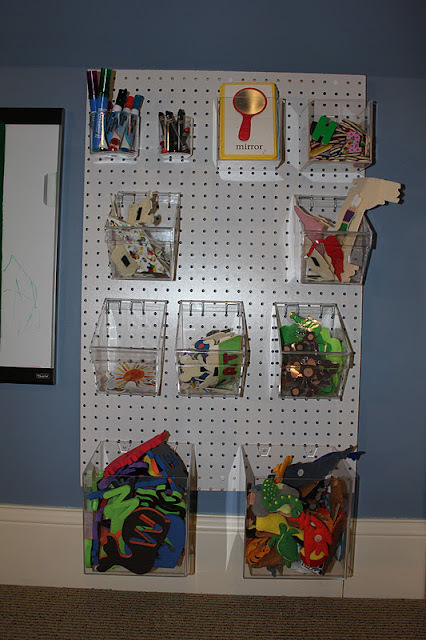 Where are the clear peg board buckets from? Would love to buy those for my peg board. Could you please tell me what brand of kitchen and refrigerator you have? Your enclosed porch, how was that done? WOW!! What an amazing play room/space!! I love how you have everything organized!! We are your newest followers! I always love seeing what you have done with the environment. Amazing!! So amazing. I would love to have this space and the stability to stay in one house long enough to create such an awesome play space. You've put in a lot of work and I know your girls are going to flourish with what you've given them. Thanks for taking the time to share, I drool over your pictures. Awesome! Thanks! I located the same train table you guys used to convert to a light table, and picked it up today (I also thought about the fact I'm due with my 2nd and could use the space for 2 to play!). This is amazing. Now if only I could figure out where to start to get a room like this, and how to slowly do it without spending a fortune. 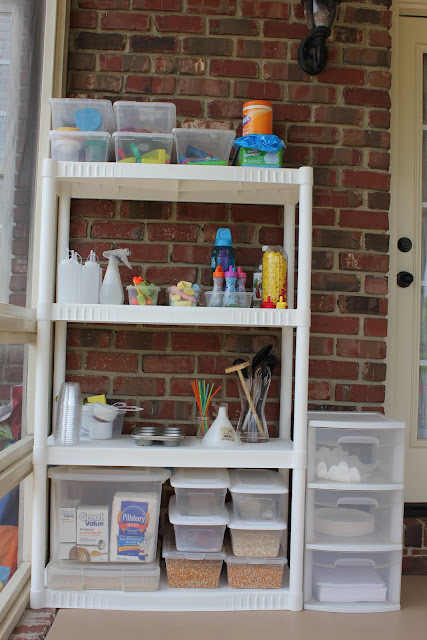 I have a 3 year old and a 8 month old I'm a newly stay at home mom and I'm trying my best to figure out what to do with my kiddos for arts and crafts, etc. I just located your site today and haven't stopped looking at all the amazing things you do! Thank You! I was wondering where you got the large contruction paper holders for the wall. Thanks! Are you able to use your outdoor space much in the winter (not sure how cold it gets in NC...)? We have a very large garage and was thinking of turning half of it into an art space for my son, but my only concern is how many months it will be unusable because of the cold. how did you hang the baby swing inside? LOVE that idea! I'd love to hear some ideas for the sensory table! Also, where did you purchase the cute kitchen play furniture? thanks for all the great ideas! I wish you could come do my house! haha I hope i can incorporate some of this into my home. Thanks for letting us peek inside-its truly magical! Hi! Where did you find / get the sensory tables? You are an inspiration! I was wondering if you could describe how you might define the play areas, if you had to split them up into separate rooms? We are moving to a house with much more room, but still no room nearly this big. 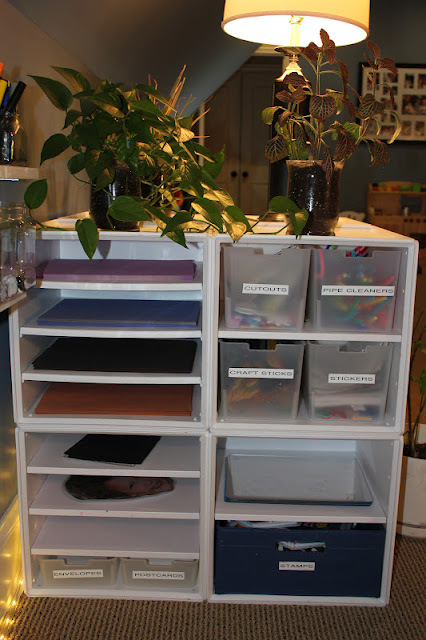 I envision using our small sunroom/den as a mini version of this, and then putting other stations around the house. Would love your advice on how those of us without a nice huge room could adapt your organization! I love it! Im your newest follower and I love this!! Your playroom is the best! Im an early interventionist that recently 'retired'. Just had baby number 3 and we have an odd room in our new house. I knew it should be a playroom but have been overwhelmed with my ideas, new budgets, and this is new role in my home! Its a blessing that Ive discovered this blog and have a starting point. Thank you so much for sharing!! My wife showed me your blog. She just loves what you've done. Now she has great ideas to add to the hunny-do list. :-) Thank you so much for sharing your ideas and inspiring other parents to have fun. 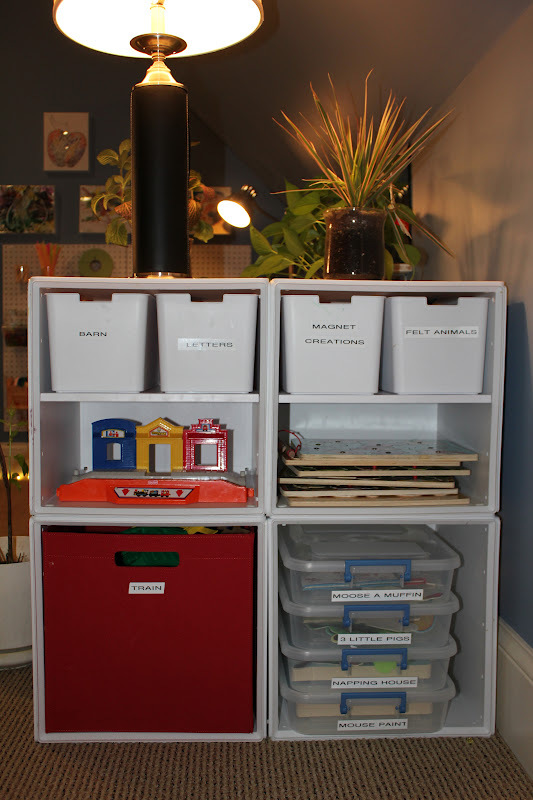 Where did you get you sensory bins? Oh i wish I had the room for a room like that for my 4 kids! Very nice! Love it. Can you tell me what you used to make the saucer swing?